The POST Science Team Meeting was held 12-13 June 2008 in Marina, CA. The presentations are available here. In the Physics of Stratocumulus Top (POST) project stratocumulus clouds (Sc) off the west coast of California are studied using a combination of aircraft measurements and modeling. The objective is to improve the understanding of the physical processes that occur near Sc top, and that influence the entrainment process and boundary-layer evolution. 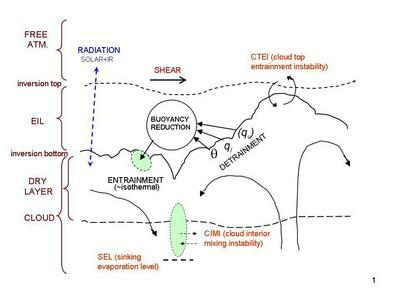 The processes include wind shear, entrainment rate, CTEI (cloud-top entrainment instability), solar and infrared radiation, hydrometeor and CCN (cloud condensation nuclei) effects, and the formation and role played by the EIL (entrainment interface layer). The study is a combination of field measurements and modeling. 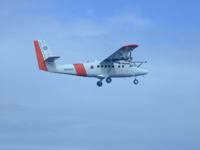 For the former, the CIRPAS Twin Otter research aircraft is deployed out of Monterey, CA for ~20 flights from 14 July to 15 August 2008. It carries a full complement of sensors to produce measurements related to those physical processes. Sensors include the UFT (ultra-fast temperature probe), PVM (fast particulate volume monitor), fast Lyman-Alpha hygrometer, PDI (phased Doppler interferometry probe), other droplet probes, gust probe, solar and infrared radiometers, and the standard set of Twin-Otter probes producing meteorology and aircraft operating properties. The aircraft is deployed primarily in fields of unbroken Sc with a stress on porpoising maneuvers vertically about Sc top to detect fine-scale behavior. Boundary layer profiles and near-surface horizontal legs are flown to deduce fluxes. NexSat and CloudSat products are compared to aircraft measurements and used to help vector the aircraft to fields of Sc. The analysis phase of the field study includes comparisons between the measured physical processes and the calculated cloud-top entrainment velocities with the purpose of clarifying the cause and effect for the latter. The study models a wide range of scales associated with the physical processes. The LEM (linear-eddy model) looks at the finest scales associated with droplet size changes. New fine-scale LES (large-eddy simulation) is applied with grid resolution comparable to the several-meters scale found for the entrained parcel size. A mesoscale model (COAMPS) deals with the larger-scale behavior of the Sc and the boundary layer, and it provides predictions for deploying the aircraft. Parameterizations of the entrainment velocity are evaluated and improved. All the preceding relate closely to the aircraft measurements for initialization and comparison. Predicting the behavior and evolution of Sc found over large areas of the sub-tropical oceans has proved to be difficult, because of the imperfect understanding of the associated physical processes and the inability to measure them accuracy. High on the priority list for better understanding is the entrainment process. The literature shows a lack of measurement success and predictive capability for this important process that affects Sc lifetime. This study uses a unique combination of aircraft measurements and modeling to focus on this lack. For the first time co-located high-rate microphysical, thermodynamic, and turbulence probes are use in conjunction with a fixed-wing aircraft deployed for unraveling the physical interactions near Sc top. Advances in measurement technology and in modeling prompted the pursuit of this study. The image above shows the mean annual wind velocity and droplet concentration from MODIS and estimated SO2 sources (courtesy of Rob Wood). 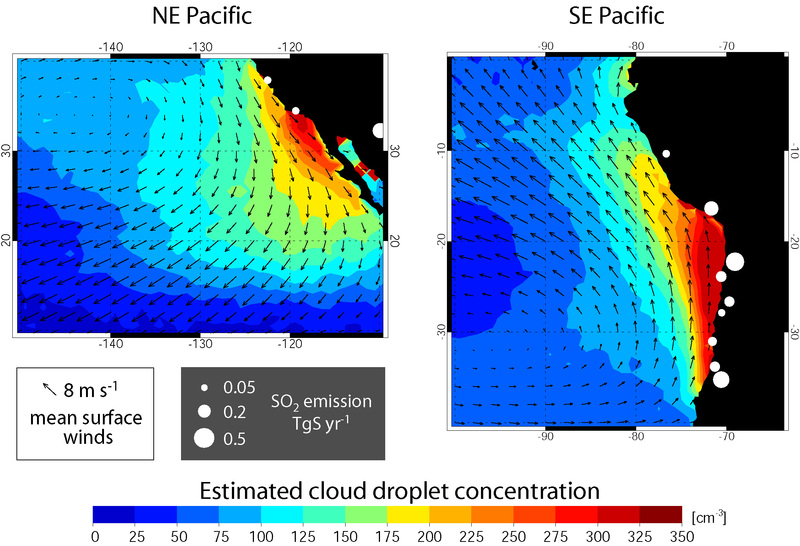 Improving the ability to predict the behavior of low-level stratocumulus found over large ocean areas is needed given their major contribution to the planetary albedo that affects the planetary radiation balance and thus global warming.